With the forecast of warm days ahead, now is the time to be proactive and prevent your field being covered with pretty yellow flowers when spring really arrives. Buttercups are actually winter weeds that are found in cool-season pastures. While they may be pretty to see in a field, these yellow flowers are actually weeds that take valuable soil nutrients from beneficial grasses we are trying to grow. They are actively growing and blooming when our cool-season grasses are beginning to grow, causing an unhealthy competition. 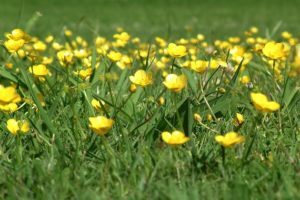 A buttercup infestation can be managed through proper soil nutrient management, proper grazing and/or mowing management, and herbicide treatments. Plan fertilization based on your soil report to provide the proper balance of soil nutrients to support healthy growth of grasses. Overgrazing of pastures is the primary contributor to buttercup infestations as thin stands of grass or bare spots in the soil allow the seeds to germinate. At this time of the year, herbicide application is the most effective method of control as the weed is already well-established in our pastures. When selecting a herbicide, products that contain 2-4-D can be applied in late winter (February in our area) to prevent buttercups from blooming, along with providing control of other broadleaf winter weeds. Try to spray on a calm day when air temperatures are forecast to be above 60 degrees for a few days to be most effective. There are several products that are safe to use in pastures where animals are grazing or fields are to be hayed. Be sure to read the product label carefully or contact your extension agent for more information in order to select the proper herbicide.